Tigerair’s new partnership with SpiceJet could unlock new opportunities for low-cost carrier growth in the India-Southeast Asia market. LCCs currently account for almost 70% of capacity within India and almost 60% within Southeast Asia but less than 30% between the two. Tigerair Singapore and SpiceJet announced on 16-Dec-2013 an interline agreement which will be implemented in phases in Jan-2014. The interline will initially only cover flights at Hyderabad but could potentially be extended to other Indian airports, particularly if they follow Hyderabad’s proactive promotion of transit passengers. For SpiceJet, the partnership creates an opportunity to compete in the India-Singapore market and potentially in a later phase to expand its offline presence in other East Asian markets. For Tigerair, the partnership significantly increases the group’s presence in India, which has emerged as one of its key markets. The interline will initially cover 14 domestic routes operated by SpiceJet from its Hyderabad hub: Ahmedabad, Bhopal, Coimbatore, Delhi, Goa, Indore, Kolkata, Mangalore, Madurai, Mumbai, Pune, Rajahmundry, Tirupati, and Visakhapatnam (Vizag). None of these destinations are currently served by Tigerair, which operates six routes connecting Singapore and India. SpiceJet passengers will be able to connect from these 14 destinations onto Tigerair’s Hyderabad-Singapore service (which operates five times per week) from 1-Jan-2014. Tigerair passengers from Singapore will be able to connect onto the same flights from 31-Jan-2014. Eight of the SpiceJet routes that are covered by the interline agreement are only served with one daily frequency or less. To maximise connections Tigerair will need to adjust its Hyderabad schedule. All five of Tigerair’s Hyderabad frequencies now operate at the same time, landing at 00:40 and taking off at 01:40. Tigerair’s website booking engine shows the carrier at least for now has no plans to add flights or change any of the flight timings, which is somewhat surprising as the schedule is not conducive for connections on the Singapore-India sector. From Singapore passengers will have to wait at least six hours for domestic connections. To Singapore the connections are much shorter with several domestic flights landing at Hyderabad late at night and in some cases after midnight. An alternating schedule with flights operating at different times of the day depending on the day of the week will be necessary to allow for quick connections in both directions. Tigerair should be able to split its five weekly flights between two schedules. Adding flights at a different time is also a possibility as the connecting traffic gained from the new partnership should help boost overall demand to and from Hyderabad. Singapore Airlines' (SIA) regional subsidiary SilkAir already has two different flight times between Singapore and Hyderabad, enabling more connections in Singapore. SilkAir is the only other carrier serving the Singapore-Hyderabad route. Hyderabad is not SpiceJet’s largest base. Delhi, Mumbai and Chennai are larger while Bangalore is about equal size. Tigerair also serves Chennai and Bangalore, making both airports potential transfer points with SpiceJet. Chennai, Hyderabad and Bangalore are located in southern India, making them ideal geographic locations to promote transfers between Singapore and all regions of India. All three cities are only about four hours from Singapore while Mumbai and Delhi are about five and a half hours. As connecting to most of India’s secondary cities from Singapore via Mumbai and Delhi requires backtracking the total journey time is generally less by connecting in Chennai, Hyderabad or Bangalore. Chennai has a larger Tigerair operation, with 13 weekly flights compared to five weekly flights at Hyderabad and seven at Bangalore. Tigerair’s largest India destination is Tiruchirappalli with 14 weekly flights. Tigerair also serves Kochi with four weekly flights and Trivandrum with three weekly flights. But Tiruchirappalli, Kochi and Trivandrum have only a small number of domestic routes operated by SpiceJet – particularly Tiruchirappalli and Trivandrum – making them less than ideal candidates for transit traffic. Tigerair’s Chennai schedule already includes flights at three different times, which would in theory maximise connections. Chennai is also the largest gateway in India for Singapore, with 61 weekly return frequencies and about 11,600 weekly seats. Six carriers serve the Chennai-Singapore route – full-service carriers Air India, Jet Airways, Singapore Airlines and SilkAir and LCCs IndiGo and Tigerair Singapore. A large proportion of the Indian diaspora in Singapore is from Tamil Nadu state where Chennai is located, creating huge demand for services between the two cities. But Chennai has separate domestic and international terminals, making connections more challenging. Air India and Jet Airways both offer domestic connections to Singapore passengers via Chennai. But neither carrier serves any other city in southern or central India from Singapore, giving them only the Chennai option for covering a large portion of India. Air India only links Singapore with Chennai and Delhi, although its LCC subsidiary Air India Express also serves Singapore-Tiruchirappalli. Jet Airways only links Singapore with Chennai, Delhi and Mumbai. IndiGo now only serves Singapore-Chennai, having dropped services from Singapore to Delhi and Mumbai in early 2013. IndiGo currently operates one daily flight on the Singapore-Chennai route while Air India and Jet both have two daily frequencies. IndiGo does not sell a connection product from Singapore although passengers are still able to self-connect at Chennai to over 10 domestic destinations. Offering a Hyderabad connection could give SpiceJet and Tigerair a competitive advantage over similar connections offered by Air India and Jet via Chennai as Hyderabad has one terminal for both domestic and international flights. The SpiceJet-Tigerair fares are also likely to be competitive, an important criteria as the Singapore-India market is generally very price sensitive outside the main business markets of Singapore-Delhi and Singapore-Mumbai. The operator Hyderabad International Airport Limited (HIAL) has agreed to offer SpiceJet and Tigerair a free porter service to its passengers to facilitate the collection and transfer of checked baggage. Transfers will be managed manually however the airport operator may look at investing in technology solutions should the traffic grow to a level that would justify the expense. HIAL’s proactive position in promoting transfers was clearly a factor in the two carriers' decision to select Hyderabad as its initial transit point. HIAL has been one of the most active Indian airport operators in traffic development. Tigerair’s hub airport Changi now offers a similar connecting service, which involves a ground handling agent collecting bags and re-checking them in while the passenger stays airside. But Tigerair charges SGD16 (USD13) to SGD20 (USD16) for the Tigerconnect/Changi Connect product, essentially passing on the cost of the service. Passengers can avoid the charge by opting to self-connect, which involves clearing immigration to collect and re-check bags. Having a free service is an obvious additional incentive as it gives passengers the convenience of remaining airside without incurring any extra costs. It would not be surprising if other LCCs take advantage of the new Hyderabad transit service. flyDubai is currently the only other foreign LCC serving Hyderabad. Offering a seamless and free connection product could help persuade other LCCs to launch service to Hyderabad. SpiceJet would also likely be open to partnering with other LCCs. Once an LCC starts to offer connections with other LCCs at a certain airport additional partnerships are often added as the platform and service has already been developed for the initial partnership. The Hyderabad transit product could also potentially be used by Indian LCCs to promote domestic to international connections. SpiceJet currently does not operate any international services from Hyderabad. IndiGo is the only Indian LCC with international services at Hyderabad with one daily flight to Dubai. Other Indian airports could consider matching Hyderabad’s offer of a free LCC connection product. Bangalore could potentially become a second option for the SpiceJet-Tigerair partnership, particularly if the airport matches the free porter service provided by Hyderabad. Bangalore also has domestic and international operations in a single terminal and like Hyderabad offers excellent infrastructure and a recently expanded modern airport. 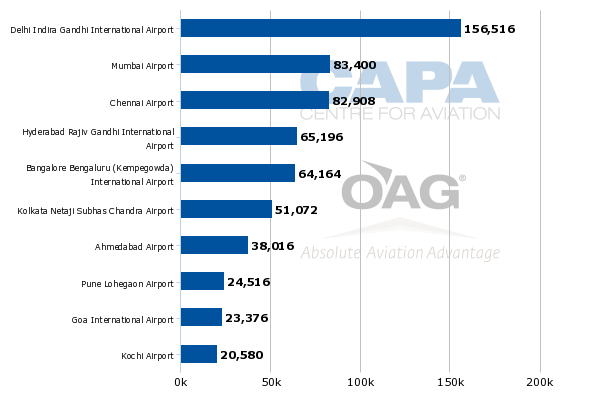 SpiceJet is the largest carrier at Chennai, accounting for 22% of total capacity at the airport and 31% of domestic capacity, according to CAPA and OAG data. IndiGo is larger than SpiceJet at Hyderabad and Bangalore and is also the leading domestic carrier in India. 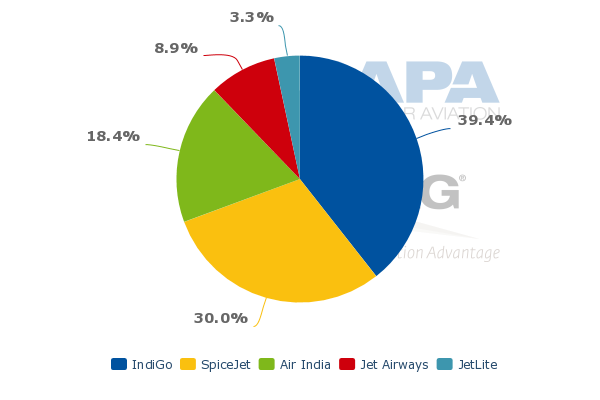 SpiceJet currently accounts for 21% of domestic capacity in the overall Indian market. At Bangalore it also has a 21% share of domestic capacity but at Hyderabad it has a higher than average 30% share, according to CAPA and OAG data. Partnering with Tigerair is a logical strategic move as SpiceJet currently does not serve Singapore. Connections beyond Singapore could be added later, leveraging the Tigerconnect product. SpiceJet is currently conducting a review to restructure its network which could see it downsize operations and cut back a number of routes. The carrier's new business plan is likely to see a greater focus on codesharing and interlining to increase revenue and support greater network reach and flexibility. This may even include the prospect of close collaboration between SpiceJet and Qatar Airways. SpiceJet currently only serves two destinations in East Asia – Bangkok from Bangalore and Pune; and Guangzhou from Delhi. The rest of the region could potentially be covered by Tigerair, allowing SpiceJet to compete with the large offline networks offered by India’s full-service carriers. It is unlikely SpiceJet would be interested in serving Singapore on its own, particularly following the challenges IndiGo was unable to overcome on the Mumbai-Singapore and Delhi-Singapore routes. While these routes have sufficient demand it is hard for LCCs to attract sufficient yields to overcome the relatively high costs of operating such long sectors with all-economy narrowbody aircraft. Chennai-Singapore is potentially a more attractive market but SpiceJet is generally keen to avoid routes with such stiff competition and instead likes to allocate international capacity to niche routes with limited competition. SpiceJet could instead later start interlining with Tigerair flights between Chennai and Singapore even if it continues to focus on offering domestic connections at Hyderabad. Standard interline prorates on domestic add-ons will deliver low yields so the arrangement will only become attractive once it delivers significant incremental traffic. With SpiceJet as a partner, Tigerair is more likely to look to extend its Indian network. The key impediment is the India-Singapore bilateral agreement, which is currently at capacity on the Singapore side. The last extension of the agreement, which took place early in 2013, only allowed for a 10% increase in capacity. While SpiceJet is generally not interested in serving Singapore, continued bilateral constraints could persuade the carrier to operate alongside Tigerair on some India-Singapore routes. The partnership with Tigerair could make such flights viable. India has plenty of unused traffic rights as Indian carriers only account for 29% of current seat capacity between the two countries. 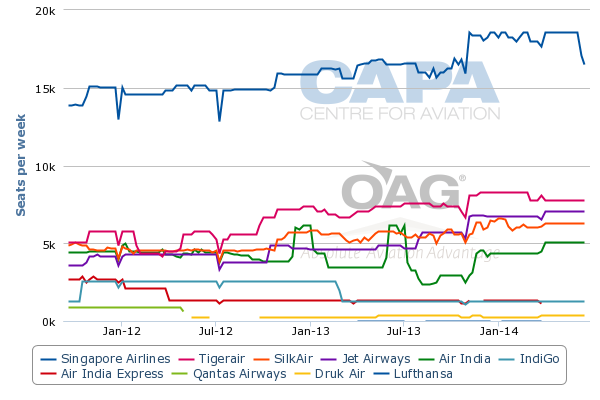 India is an important market for Tigerair, SIA/SilkAir and hence the SIA Group. This was reinforced by SIA’s decision to pursue a joint venture with Tata to establish an Indian full-service carrier, which is expected to launch in 2014. Tigerair and the SIA Group could potentially look to further expand its position in India by acquiring a stake in SpiceJet. Having investments in both India’s full-service and low-cost sectors would be logical but could rock SIA’s relationship with Tata, which has a joint venture with AirAsia to establish an LCC in India. So far Tigerair has not made a move on acquiring an equity stake in SpiceJet, which has attracted interest from other carriers and has been looking at raising capital by selling a minority stake to a foreign carrier. Tigerair for now is touting its new “asset-light” strategy for expanding through partnerships, which suggests the group is looking to add more interlines but not necessarily take stakes in other carriers. Even with planned new affiliate Tigerair Taiwan the group is only taking a 10% stake. India, however, is an important enough market for Tigerair to consider an equity investment. India currently accounts for about 12% of Tigerair Singapore’s seat capacity. It is the carrier’s fourth largest market and largest outside Southeast Asia. Tigerair could also potentially serve India from Indonesia, where its affiliate Tigerair Mandala is based. Indonesia is the largest market from India which is not currently served non-stop. SpiceJet and Tigerair could initially tap into this market via Singapore and or via a new non-stop service from Tigerair Mandala. Tigerair Mandala and other Indonesian carriers have been looking at the possibility of serving India from Medan on the island of Sumatra, which has a large Indian population and is closer to India than Jakarta. Chennai is a more likely destination than Hyderabad from Medan as a large portion of Sumatra’s Indian population is from the Chennai area. Connections on both ends would help make the route viable. As Medan-Chennai would primarily be a leisure or visiting family and relatives (VFR) market an LCC is more likely to succeed than a full-service carrier. There is huge potential for LCCs generally in the Southeast Asia-India market given the ethnic ties and the large Indian migrant worker population in Southeast Asia. LCCs over the past decade have expanded rapidly and successfully in both Southeast Asia and India. But between Southeast Asia and India there have been almost as many LCC route failures as successes. 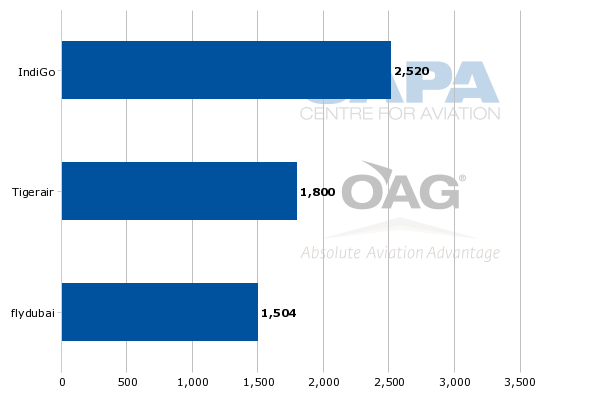 As a result LCCs currently only account for about 28% of capacity between Southeast Asia and India. LCC partnerships could change the dynamics and lead to faster LCC growth between Southeast Asia and India. The full-service carriers in the market have the advantage of offering connections on both ends using a wide array of partners. Through innovative partnerships that provide feed without the traditional costs or complexities of codeshares LCCs are able to offer similar connections at lower fares. After it launches AirAsia India will naturally look to partner with other AirAsia carriers, all of which are based in Southeast Asia. The SpiceJet-Tigerair partnership could be an early response to AirAsia’s plans for increasing focus on the Indian market. India’s other independent LCCs, IndiGo and Go Air, may also need to respond by pursuing their own partnerships in Southeast Asia. While initially a relatively small partnership, the SpiceJet-Tigerair tie-up could end up having significant implications.